The defending champion Senate Defenders look to sustain their impressive showing in the second phase of the elims when they face the PITC Global Traders at the start of the quarterfinal round in the 7th UNTV Cup on Sunday at the Pasig City Sports Center. 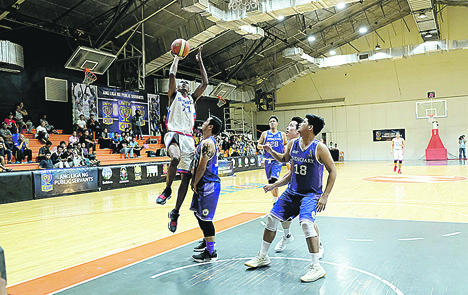 Jeff Sanders hopes to lead the Senate Defenders to a fourth straight win when they face the PITC Global Traders at the start of the quarterfinal round of the 7th UNTV Cup on Sunday at the Pasig City Sports Center. Game time is at 4:30 p.m. with the Defenders slightly favored on account of their improved plays that enabled them to recover from a roller-coaster performance in the first round. Mentored by Mike Fermin, the Senate Defenders finished the two-round elims with a with a 6-3 mark after going 3-1 in the second round, including a thrilling 64-63 win over longtime rival Judiciary. Out to lead the Defenders are Harly Ng, Reynaldo Malaga, Jr., Garri Sevilla and former PBA player Jeff Sanders. Also going for a winning start is Malacañang-Philippine Sports Commission, which tackles the National Housing Authority at 3 p.m. The four teams play one more round with the top two finishers joining early semifinalists Armed Forces of the Philippines and Philippine National Police in the next round, which is a best-of-three affair. Malacañang-PSC missed securing an outright semis berth after losing badly to the AFP Cavaliers, 98-87, last Sunday. The chosen charity of the champion team in the event organized by UNTV president and CEO Dr. Daniel Razon will get P4 million, with the runner up’s charity taking P2 million.